"What do you have to be depressed about?" Bet you've heard that one before. Or how about, "You're depressed? Just get over it!" Easier said than done, right? Or here's a favorite, "They have a pill for that now, you know." Unfortunately, such naïve armchair psychology rarely works for someone suffering from the very real plight of depression. All it does is seek to trivialize depression and characterize depressed people as "whiners" who have nothing better to do than to "complain about their lives." But the truth is, depression is a very real problem. In fact, the World Health Organization estimates that, on any given day, 121 million people worldwide suffer from depression. And depression rates continue to increase – for example, kids exhibit depression at nearly ten times the rate of previous generations. Theories abound as to why depression rates are increasing, but regardless of the cause, this scourge continues to rob its victims of happiness, joy, and the capacity to give and receive love. 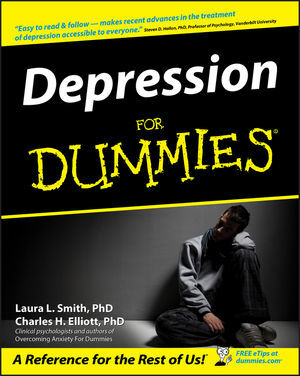 So why Depression For Dummies, when there's already a glut of self-help books on the market peddling so-called cures and remedies for depression? Because this book satisfies the need for a straight-talking, no-nonsense resource on depression. The only agenda of Depression For Dummies is to present you with the facts on depression and explain the options for dealing with it. Rest assured, this is no infomercial in a yellow and black cover. So, whatever your level of depression – whether you suffer from occasional bouts or you find yourself seriously debilitated by depression – Depression For Dummies can give you the insight and tools you need to once again find enjoyment and happiness in life. All it takes is one step. Laura L. Smith, PhD and Charles H. Elliott, PhD are both international speakers who have clinical practices specializing in the treatment of depression, anxiety, and other mood disorders. Part I: Discovering Depression and Preparing a Plan. Chapter 1: Demystifying and Defeating Depression. Chapter 3: Breaking Barriers to Change. Chapter 4: Finding Help for Depression. Part II: Untwisting Your Thinking: Thought Therapy. Chapter 5: Discovering Depression-Driven Thinking. Chapter 6: Breaking Up the Dark Clouds of Depressive Thinking. Chapter 7: Discovering the Cracked Lenses Behind Depression. Chapter 8: Mending Your Memory. Part III: Taking Action Against Depression: Behavior Therapy. Chapter 9: Getting Out of Bed. Chapter 10: Working Out to Lift Depression. Chapter 11: Rediscovering Healthy Pleasures. Chapter 12: Solving Life’s Headaches. Part IV: Rebuilding Connections: Relationship Therapy. Chapter 13:Working Through Loss, Grief, and Mourning. Part V: Fighting the Physical Foe: Biological Therapies. Chapter 16: Hype, Help, or Hope? Alternative Treatments for Depression. Part VI: Looking Beyond Depression. Chapter 17: Reducing the Risk of Relapse. Chapter 18: Confronting Depression with Mindfulness. Chapter 19: Pursuing Happiness Through Positive Psychology. Chapter 20: Ten Ways Out of a Bad Mood. Chapter 21: Ten Ways to Help Kids With Depression. Chapter 22: Ten Ways to Help a Friend or Lover with Depression.